This past Sunday we had the opportunity to cover Muddy Buddy. For people who are not familiar with this event it usually takes place in many different cities all over the United States. This weekend’s event happened to be the last Muddy Buddy event of the year. It took place at Bonelli Park in San Dimas, the same park where we covered the Renegade Adventure Race. However, this event is even more popular than Renegade so the park was packed full of participants and spectators. We chose to park in the park-and-ride area just outside of the park which we highly recommend because the line of cars going into the park was crazy. The parking inside was beyond full, they were actually parking cars in the picnic areas on the grass, we had never seen Bonelli so full before. 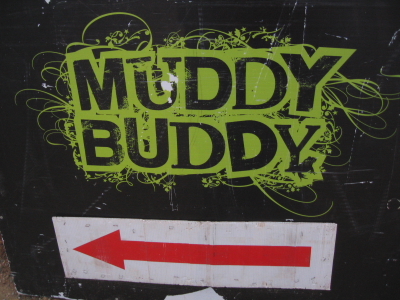 Muddy Buddy requires a team of two to race around the park by either running or biking. The teams constantly switch off running and biking and also have to complete several obstacles along the course. 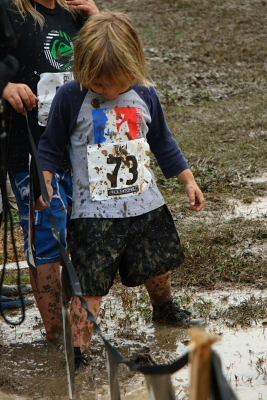 The finale of the race has the teams doing an army crawl in a mud pit before crossing the finish line. Did I mention the majority of the teams are in costume? That’s right, you have teams of cowgirls, milkmen, bunnies, Crayola crayons and even John McCain and Sarah Palin look-alikes competing against each other making this event all the more entertaining. Bryan had stationed himself at one of the obstacles along the course. This particular obstacle required the teams to climb up the side of an inflatable slide and then slide down. I stationed myself at the mud pit, I was in the spectator area so I figured I would not be in the splash zone. Well that wasn’t the case, after about 20 minutes my pants, jacket and camera bag had drops of mud on them. Unfortunately, so did my poor camera, I kept having to wipe mud off the lens. Watching these teams crawl through the mud looked like so much fun, you could tell some of the spectators wanted to jump right in, especially the kids. Many of the spectators didn’t need to jump in as they got covered in mud just from watching. Just in case things weren’t already muddy enough for the event it started pouring rain outside. It was the first rain we had gotten in a while so it was nice but it made photographing just a bit more difficult, as the equipment I was using is not sealed. I think we both got some pretty hilarious shots and we learned an important lesson for next year: bring a poncho! To see more race coverage check out Amateur Endurance and of course to see more photos from Muddy Buddy check out our GALLERY.